Editor's note: The "bold, bad men" were Bonnie Parker, Clyde Barrow and their gang members. For the rest of the story, see: Bill Brock relates Story of Highway Robbery at Meade Park, The Fowler News, September 7, 1933, and Bonnie Parker Worked in Dodge, Barrow in Hugoton, The Dodge City Globe, September 19, 1934. The Western Star, September 8, 1933. On Monday afternoon of this week, as Mr. Trummel was returning in his Chevrolet car from the Sun City rodeo, and when within a mile and a half of home, he was suddenly stopped by a car which stood across the road, and in which there were three men and one woman. The men displayed a machine gun and two automatics and ordered Alva to turn over his car to them. They left the car in which they had been riding - an old Ford which they had stolen near Meno, Okla. - and all got into Mr. Trummel's car and they drove on west past Alva's home. His wife, who was in the yard, saw the car go by, and thought it must be their car, but, of course, could not stop it. Alva told the men to take his car and let him out at home, but they told him to "duck down" and he "ducked" without hesitation. The bandits (for it is evident that they were trying to get away from officers who wanted them to answer to the charge of committing some crime) drove the car to the Herd corner near Coldwater, then north to near the county line and west to the Pleasant Ridge school house. There they stopped long enough to break in the door and steal some towels, buckets, rope, etc. Then they proceeded on to Meade, but, near Meade, the unexpected happened. One of the bandits was driving the car. The woman, presumed his wife, was badly wounded, having been shot in one leg. The driver started to move an automatic to make the woman more comfortable and as he did so the car slipped into a deep mud hole along the newly graded road. They were unable to drive the car out of the mud hole and commandeered a small car when it was unable to pull the Chevrolet out of the ditch. One of the bandits was ordered to go to the town park nearby and commandeer a large car. The man went to a car in which a woman was sitting and told her to keep quiet and turn the car over to him. Instead, the woman screamed and some croquet players nearby grappled with the bandit, but could not get his gun way from him. A woman grabbed a croquet mallet and struck the bandit and he was overpowered. The other bandits, seeing the hard luck of their pal, drove away in the small car - nobody knows where, as yet. The third bandit was arrested and placed in the Meade jail. Thus it happened that Mr. Trummel was left alone with his car. With the aid of some Meade people, he got his car out of the ditch and, the next day, returned home, unharmed. Meanwhile, his wife and neighbors had been making a thorough search for him, at least up to late Monday night when Alva phoned his wife from Meade - and she fainted when she heard the good news. 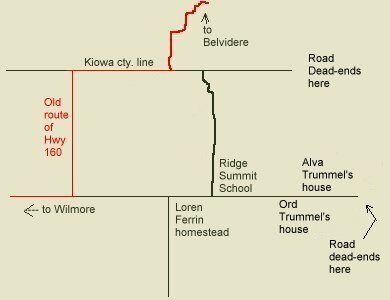 "They needed more room and I had it," explained A. E. Trummel, rancher from Wilmore, Kans., who was kidnapped Monday afternoon by four bandits, including a wounded woman, who previously had escaped from officers in a gun fight at Enid, Okla.
Mr. Trummel was in Meade Tuesday morning, where his car was stalled in a ditch by the bandits at 9 o'clock Monday evening, after which they commandeered a Chevrolet coupe from Alvin Gerber of Fowler, whom they had called from a picnic to help get them out of the ditch. "I was going home from the rodeo at Sun City and I was within a few miles of my ranch ten miles east of Wilmore, when they stopped me," Mr. Trummel said. "The three men drew a machine gun and automatics on me as they stopped me along the road. I have a Chevrolet sedan. They were driving a Ford roadster they had stolen in Oklahoma, the fourth car they had taken in their flight, I later learned. The woman was badly hurt. She had a badly lacerated leg and several cuts, and I thought she acted as tho she may have been hurt internally. The three men also had minor injuries. They said they ran into a place where a bridge was washed out north of Alva, Okla. They said something about a clash with officers in Oklahoma, and the papers this morning said it was at Enid. They didn't talk much on the road. They did the driving. The driver ran into a ditch right by the park and stalled my car. They tried to get it out and then one man went over into the park to see if he could pick up a car. The others called some Fowler people to help get my car out of the ditch. The Fowler boys went to work, but I said I wasn't so anxious to get them out, because it was my outfit. Then about that time we heard all the commotion over in the park and they put a machine gun on the Fowler boy and took his Chevvie coupe. They loaded the injured woman and their guns into the car and took off. They didn't offer to take any one with 'em and I was glad I was out of the mess with my car, even if it was stalled in the ditch. The woman was very small and slender. One of the men weighed around 140 pounds and was medium in complexion and build. The other who got away was dark, small and slender and weighed about 125 or 130 pounds. The one caught in the Meade park was larger than the others." On Tuesday, Sheriff W. T. Giles of this county brought to Coldwater the car left by the bandits east of Wilmore. Judging from the blood in the car, it is evident that the woman in the car with the bandits was badly injured. The owner of the car, an Oklahoma farmer, came to Coldwater on Thursday and after identifying the automobile, drove it home. 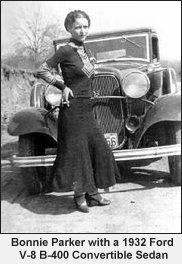 One may wonder why Bonnie and Clyde happened to be stopped on the country road where they kidnapped Alva Trummel. One possible reason was given by Nancy Smith in an email to Jerry Ferrin, 29 April 2005: they may have had one or more flat tires. "I was just thinking about Belvidere and remembered a story that someone shared with me years ago. Seems as if a bank was robbed somewhere in the vicinity of Belvidere (Pratt comes to mind, but I don�t recall the particular town.) The robbers were none other than Bonnie and Clyde and they took off heading in the general direction of Belvidere. Wanting to do what they could to help catch the robbers, some of the town's residents threw a bunch of tacks out on the road, hoping that they would cause the tires to blow out on the get-away vehicle. All of their efforts were in vain, as their ploy to stop the robbers failed. But, many a flat tire was repaired in days to come by local townspeople, as they drove into town and over the tacks." Bill Brock relates Story of Highway Robbery at Meade Park, The Fowler News, September 7, 1933. No Trace Found of Trio Who Kidnapped Barber at Coldwater Friday Night: H. E. Pipkin Freed by Kidnappers Late Friday Evening Near Olin Millam Farm, The Western Star, June 8, 1934. "On Monday afternoon of this week, as Mr. Trummel was returning in his Chevrolet car from the Sun City rodeo, and when within a mile and a half of home, he was suddenly stopped by a car which stood across the road, and in which there were three men and one woman. The men displayed a machine gun and two automatics and ordered Alva to turn over his car to them." -- The Western Star, September 8, 1933. "The woman, presumed his wife, was badly wounded, having been shot in one leg..." "The woman was badly hurt. She had a badly lacerated leg and several cuts, and I thought she acted as tho she may have been hurt internally. The three men also had minor injuries. They said they ran into a place where a bridge was washed out north of Alva, Okla. -- The Western Star, September 8, 1933. "The woman was very small and slender." -- The Western Star, September 8, 1933. 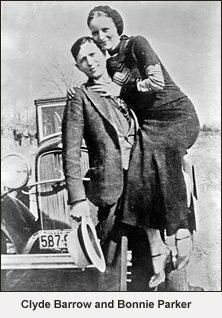 Bonnie and Clyde - Wikipedia article. Issued 2 days before they were killed on 23 May 1934. In Search of Bonnie & Clyde Places in or near Dallas, Texas associated with the Barrow Gang. The following RootsWeb Visitors Counter began counting on 11 May 2008. This RootsWeb website is being created by Jerry Ferrin with the able assistance of many Contributors. Your comments, suggestions and contributions of historical information and photographs to this site are welcome. Please sign the Guest Book. This page was created 30 April 2005 and was last updated 11 May 2008.